So Friday after work I came home and went back out to get gas for the lawnmower to do some yard work this weekend. I’d usually have just went Saturday morning, but the gas stations all over the area were raising their prices to outrageous levels in a panic over what hurricane Ike might do to Houston. But I went Friday night. And I normally would have turned right to go to the closer independent gas station that’s usually cheaper than the one by the highway exit. But I’d just driven past that station and it had the highest price of ANY of the 8-10 places I drive past on the way home. Halfway there, a Ford pickup truck (F150 or bigger) in the oncoming lane swerved directly into my lane. Accounts vary as to whether he was swerving to avoid rear-ending someone in front of him, or simply passing in a no passing zone. Regardless, all witnesses put him clearly in the wrong. I swerved to the right to the side of the road/ditch, as they teach you way back in driver’s education, but so did he, and we hit head-on. Looking at all the carnage, it’s amazing, but I’m mostly ok. After a trip to the hospital on the body board, cognative tests, blood tests, and a CT scan I ‘walked away’ from this. I feel like I went 16 rounds with Mike Tyson, but no broken bones, no internal organ injuries. Just some major bruising and muscle aches that I’m sure I’m just beginning to experience. Actually found a big one last night on my left hip from the seat belt, to go with the big one on my left shoulder. Moral of the story: Seat belts and airbags save lives. Plain and simple. Being a nice day, my driver’s window was down. 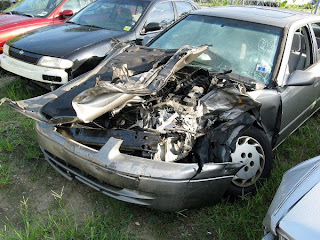 The seatbelt kept me IN the car, and the airbags saved my life. The first responders were amazed I was in as good of shape as I was. These people deal with this every day, and it really shows on their faces when they can take someone out alive from something like this. Couldn’t help putting this one in…. When my wife went to clean out the car, she found a bisque pot that I had in the trunk. Intact. Those Toyota engineers really know what they’re doing. This entry was posted in about me, thoughts on September 13, 2008 by Fields Brian. Brian — wow! I am glad you are ok! 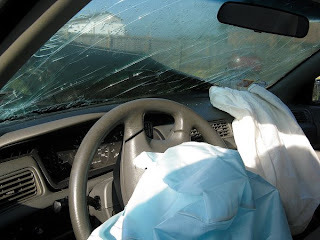 Your guardian angel was working along with those air bags & seat belts. Hope all the aches & pains heal quickly & you're back to pots in no time! Yikes, your time on earth and playing with the earth is not over yet! HOpe you are feeling well…in all ways. I was having a pity party this morning after more carnage coming out of the kiln…. You put it in perspective. Glad you are okay, tHat is some scary stuff! Yikes! Sorry about your car, but glad that you’re ok! Hi Brian, I see from your blog that you were involved in a serious accident, but so glad you are ok.
My name is Nicola Lindsay & I work at Argyll Pottery. I got the link through to your page from Alans blog & I am answering the comments left as Alan has had an accident yesterday on his bike & passed away. I don't know what people have heard, if anything, or have seen on the news as it was reported last night. If you could please pass on this news as we are doing our best to let people know. Thank you everyone for your kind words and thoughts. Nicola’s comment really puts this in perspective though. Please keep Alan’s family and friends in your thoughts and prayers.